Subject to availability and additional fees. Additional fees may apply. Subject to availability and modifications. Cannot be combined with other offers or on previously purchased tickets. All sales final. Blue Man Group reserves all rights. The Blue Men combine drumming with paint to create a rhythmic explosion of vibrant color. They’re bald, they’re blue, and they’ll make you laugh. Meet the Blue Men and see the world in a totally new way. Constructed from PVC pipes, this imaginative percussion instrument makes a one-of-a-kind sound. Blue Man Group is still performing to sold-out crowds in its original location. Experience the show where it first began—up close and personal—at the intimate Astor Place Theatre in downtown New York City. 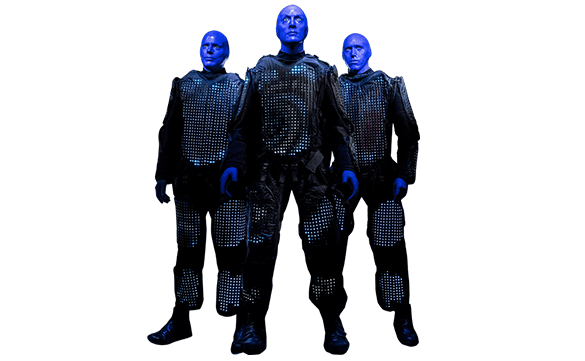 35 million people of all ages, languages and cultures have experienced the imaginative, multi-sensory world of Blue Man Group. Now it’s your turn to see the off-broadway hit in New York . take a selfie. The Blue Men love a good selfie. Top it all off with a Very Important Souvenir. Since you are a VIP we want to make sure you have options so if you want even more we have a VIP Jam Session. 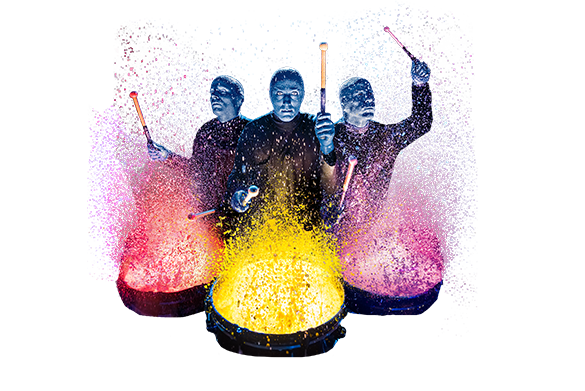 Enjoy a 20-minute pre-show Jam Session with a Blue Man Group Band Member where you’ll learn drum patterns to a Blue Man Group song and play on a custom-made instrument. What is Blue Man Group all about? 35 million people of all ages and cultures know what Blue Man Group is really about. Now it’s your turn! Blue Man Group – Hard to Describe. Easy to Love. How long is a Blue Man Group performance? What is the poncho section and will I get wet sitting there? During the Blue Man Group performance, materials sometimes splatter off of the stage. We call this “The poncho section,” because we provide disposable plastic ponchos for audience members to wear if they prefer. You will not get “wet,” but you may be splashed with materials. All materials are washable, but we suggest you wear your poncho and comfortable washable clothing that does not need dry cleaning. What language is Blue Man Group performed in? Blue Man Group performances are euphoric celebrations of human connection through art, music, comedy and non-verbal communication. Since the Blue Men don’t speak, Blue Man Group is universally appealing to a broad range of age groups and cultural backgrounds. Late patrons are seated at the discretion of the management at a time when seating will not interrupt the show. Does Blue Man Group perform every day? The schedule varies by city and season, but Blue Man Group performs most days and weeks of the year. Please check the calendars for each city to find tickets, dates and times that work best for you. How do I become a Blue Man or play in the band? Our Casting team holds regular auditions. Visit our Casting page to learn all about the process and submit yourself for consideration. Is there food available at the theater? Yes, snacks and beverages are available for purchase in the lobby. How far in advance can I purchase Blue Man Group tickets? 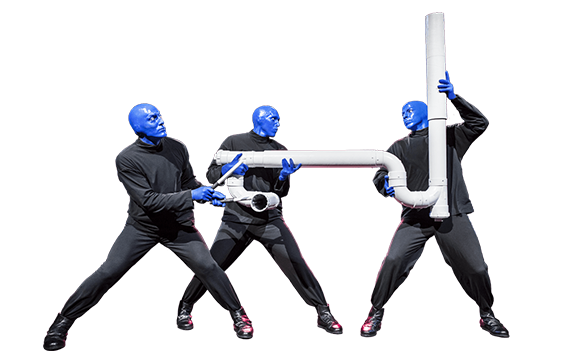 Blue Man Group tickets are generally on sale 3 – 6 months in advance. Please check the calendars for each city to find tickets, dates and times that work best for you. Is Blue Man Group wheelchair accessible? What is the appropriate age to bring my child to Blue Man Group? 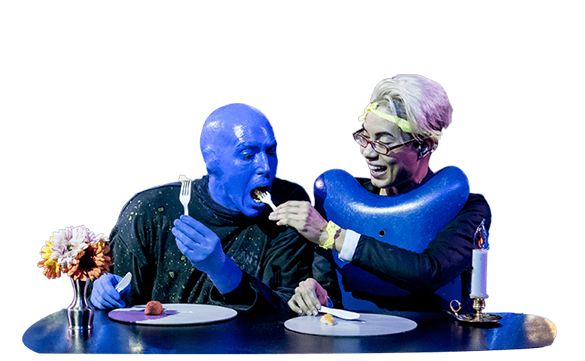 Blue Man Group is a family-friendly performance appropriate for kids, teens and adults. Children under three (3) are not permitted into the performance and everyone, regardless of age, requires a ticket. Are there restaurants and bars near Blue Man Group? Click here for details from some of our conveniently located partner restaurants. Does Blue Man Group have strobe lights? Yes, strobe lights are used during portions of the show. If you are sensitive to strobe lights, please alert the House Manager when you arrive. Upon request, a staff member will help you leave the theater before strobe lights occur. Does Blue Man Group host sensory-friendly performances? How many people do I need to get group tickets? Group discounts start at 10 people. Groups receive exclusive discount rates at many performances, avoid online service fees, and can get priority booking before dates are on-sale to the general public. We offer flexible payment policies, allowing you to hold reservations and modify them until a few weeks prior to the performance. Plus, our dedicated Group Sales team in each city will guide any questions you may have along the way, and make your experience quick, easy and fun. Learn more at groups.blueman.com and contact Group Sales at 800-BLUEMAN or email us at groupsales@blueman.com to begin. Is there a dress code for Blue Man Group? There is no specific dress code for the show, though we suggest casual, comfortable clothing. What is the difference between Blue Man Group shows / locations? At every Blue Man Group show, you’ll experience our signature combination of music, comedy and color with elements customized for every venue. The performances feature iconic moments and are continually injected with new music, fresh stories, original instruments and sensory stimulating graphics. At the heart of the show is the Blue Man character, creating a unique connection with the audience and a different experience at each performance. In the Astor Place Theatre, you’ll get to know the Blue Men up close and personal where the off-Broadway sensation started. What kind of security is in place at Blue Man Group theaters? Blue Man Group is dedicated to fostering a safe and secure environment for our guests. All guests and their bags are subject to security screenings and/or searches upon arrival at the theater. Weapons of any kind, regardless of permit, are not allowed in the theater. The list of prohibited items includes, but is not limited to: firearms, knives, batons, mace, pepper spray, brass knuckles, Tasers, or any other items that security personnel deem dangerous or threatening to public safety. By tendering a ticket and entering the theater, guests consent to such searches and waive any related claims. Any guest in possession of a weapon, without exception, will be denied entry and asked to leave the premises. Blue Man Group will not be responsible for the on-site storage of weapons. We appreciate your cooperation. What time should I arrive at Blue Man Group? We want to make sure you don’t miss any of the fun so please leave yourself plenty of time for travel, parking, waiting for public transportation, navigating city streets, security screenings and bathroom visits prior to the performance. Theater doors open 30 minutes before show time and we recommend you arrive at the theater no later than 15 minutes before show time. Large groups should plan to arrive even earlier. Where do I park for Blue Man Group? There are two parking garages conveniently located at 403 and 410 Lafayette Street. BOOK YOUR PARKING TODAY or claim YOUR DISCOUNT COUPON. View the map. Where is the Blue Man Group theater? For ticketing questions, call 800-258-3626. For general inquiries, email us at info@blueman.com.